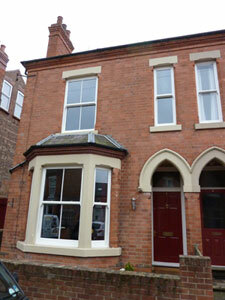 7 Timber Alternative UPVc Sliding Sash Windows from the Bygone Collection were installed. 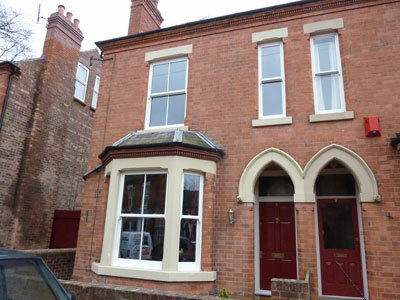 The original wooden, single glazed, sash windows were removed and replaced with Timber Alternative UPVc, double glazed, ’A’ rated sliding sash windows. 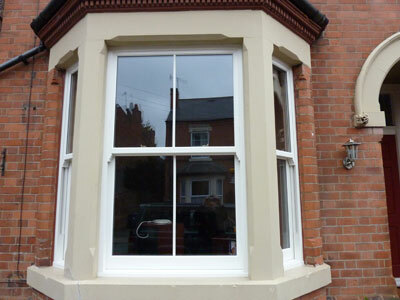 The client had delayed replacing the wooden sash windows for many years, but after seeing an installation we had completed in another area of West Bridgford, decided to request a home visit to see a sample close up. The rest is history. Testimonial from a delighted customer. Could I take this opportunity to thank you for our new sash windows. We are delighted with them and the difference they have made to our house, both its temperature (particularly in the front room where we used to get very cold feet sitting and watching TV during the winter) and its appearance (which is improved by them rather than spoilt, as is the case with any other uPVC sash windows we have seen). And please pass on our thanks to the team that fitted them for us, both for the quality and the cleanliness of their work, which were excellent and indicated an unusually high level of care and attention to detail.